Capricorn “Cap” Anderson isn’t just working the retro-hippie vibe, he IS the genuine, tie-dyed article. Homeschooled by his grandmother Rain, he’s grown up on a commune where the most exciting event in his week is going into town to pick up more tofu and duct tape. But when Rain breaks her hip and must go into the hospital, Cap is forced to live in the suburbs with a social worker and attend the local middle school. Though he is disturbed by all the noise and confusion, Cap is able to meet the new challenge with his usual Buddhist calm, practicing tai chi during lunch, and leading Beatles singalongs in the music room. But what happens when the most popular guy at school decides to set Cap up as the mock eighth grade president? Suddenly Cap is being peppered with questions about the annual Halloween dance and whether or not he intends to press the issue of getting all the water fountains converted to Gatorade. Utterly confused by the bizarre behavior of his peers (and not even quite sure how he came to be president) can this homeschooled zero turn the tables and become a middle school hero? Gordon Korman, author of Born to Rock and Son of the Mob has written another of his signature rib-tickling stories, which tend to be bright beacons of funny in a YA-angst ridden world. By telling his tale through the eyes of a complete innocent, Korman makes a place that is familiar to all of us unexpectedly and delightfully absurd. Get Schooled! Blame it on Speedball. He was the leader of the minor superhero team who were making their living as reality TV stars. But when Speedball and Co. go after a group of villains that are way out of their league in front of the cameras, the fallout from their neighborhood battle is tragic—an entire elementary school is wiped off the map when one of the bad guys goes nuclear. Suddenly the citizens of the United States are up in arms, demanding that all superheroes must be made to register their powers with the government. Leading the pro-registration movement is Tony Stark, aka Ironman, with Peter Parker, the Amazing Spiderman at his side. But not every super person is thrilled about the idea of unmasking, namely Mr. US of A himself, Captain America, who counts half of the Fantastic Four and Daredevil on his side. What happens when the two super sides collide is Civil War, the amazing Marvel comic series that has been sweeping the nation for the past year, and has now been collected into several graphic novels. In addition to reading the main Civil War storyline, you may want to fill in the back story by reading about the conflict through the eyes of some of your other favorite Marvel heroes. My favs wereAmazing Spider-Man, No. 533 (Civil War: Spiderman Unmasked) and Civil War: Young Avengers & Runaways Think about it–who’s side are YOU on? She’s smart, she’s fast, and she’s supadupa-fly–except for the fact she’s a spider! Just don’t call her Spider-Girl, she’s Anya Corazon, aka Arana, the Latina teen who just happened to be in the right place at the right time to score the kinds of acrobatic moves that would make Spider-man look about as scary as a Daddy Long-Legs. Now that she’s working for the mysterious WebCorps, with tall dark Miguel as her Muse, Anya is slowly learning how to harness her Hunter powers in order to trap WASPS, a shadowy criminal underground organization that operates outside society and the law. But how is she going to bust chops, find a decent superhero costume (one of the funniest sequences in the book) and maintain a B+ average at the same time? This first volume of Arana’s adventures is fast-paced and full of laughs, while not giving readers all the answers about Anya’s uncertain future, which is why you’re gonna want to score Arana Volume 2: In The Beginning and Arana Volume 3: Night Of The Hunter as well. And if you like Anya, check out the other titles in the Marvel Age/Adventures imprint. This imprint has always been been near and dear to my heart since it was the one to launch Runaways. If you saw someone die right in front of you, what would you do? Run? Scream? Pull out your cell and dial 911? Or would you go home and pray no one ever found out you were there? The terrified narrator of Paranoid Park does exactly that—see, he wasn’t supposed to be hanging out at the notorious skate park, and he certainly wasn’t supposed to be hopping trains and joy-riding into the old freight yards. But he was and he did. So he was there when the freight yard security guard who tried to chase him tripped and fell under the deadly wheels of the train. Our boy takes one look and runs for the hills. Now he is consumed with fear and guilt. Did anyone see him? Will he be blamed for the man’s death? Has he ruined his life forever? As you read the choices the unnamed narrator makes, you can’t help but put yourself in his shoes: what would YOU do? Loosely based on the Russian classic Crime and Punishment, this white-knuckle nailbiter was an especially popular title with the 8th grade boys at my school this year. And don’t miss Paranoid Park: the movie, directed by Gus Van Sant, out in spring ’08. Laine can’t quite believe that Leah Green, her one time best friend, is dead. But Laine was there when Leah ran off the road and wrapped her black sports car around a tree. And while she feels both guilt and shame, her biggest feeling is relief. Because now she’ll finally be able to come out from under the shadow beautiful, popular Leah has cast over her life since fifth grade. When they were little, Leah used to take Laine into her toy closet to “practice” what they would do with boys when they grew up. Then Leah maliciously used the secret of the closet to blackmail Laine into doing what Leah wanted. Why wouldn’t Leah just leave Laine alone? How could she have been so kind and so brutal at the same time? Laine tries to figure out the reasons behind Leah’s cruel manipulations in the days after her death, and as she explores each “lesson from a dead girl,” she begins to understand Leah was part of a cycle of abuse—a cycle that Laine can now bring to an end. This suspenseful, disturbing debut will help older teen readers understand that abusers are victims, too. If you enjoy the emotional, gritty work of E.R. 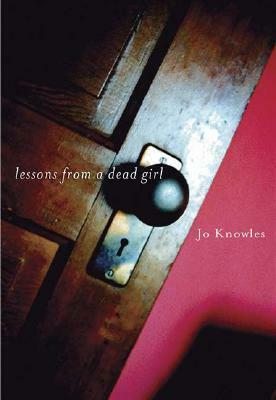 Frank or Ellen Hopkins, you’re gonna love Jo Knowles. V is an addict. But not to any of the usual things: food, drugs, alcohol. No, V’s not an alcoholic—she’s a guyaholic. Every time V is reminded of the fact that her mom Aimee dumped V on her grandparents so she could chase yet another romantic interest across the country, V ends up seeking her own hottie to drown her sorrows in. Until she is hit in the head with a hockey puck and comes to in the arms of gentle Sam, the first boy who wants to be more to her than just another make-out partner. But V’s addiction is strong, and she ends up breaking Sam’s heart just when she needs him the most. V decides the only way to purge her feelings of anger and loss towards her mother is to find Aimee and force her to spend time with only daughter. But on her way to her mom, V ends up taking an entirely different journey where she discovers the secret to curing her addiction and the way back into Sam’s arms. This short, sassy companion novel to Mackler’s Vegan Virgin Valentine manages to be caustically funny, while imparting the very important message that you can only run from your feelings for so long before you must deal! V is a train wreck for sure, but a very funny one, and will leave many readers nodding in recognition over her self-destructive but completely understandable behavior.